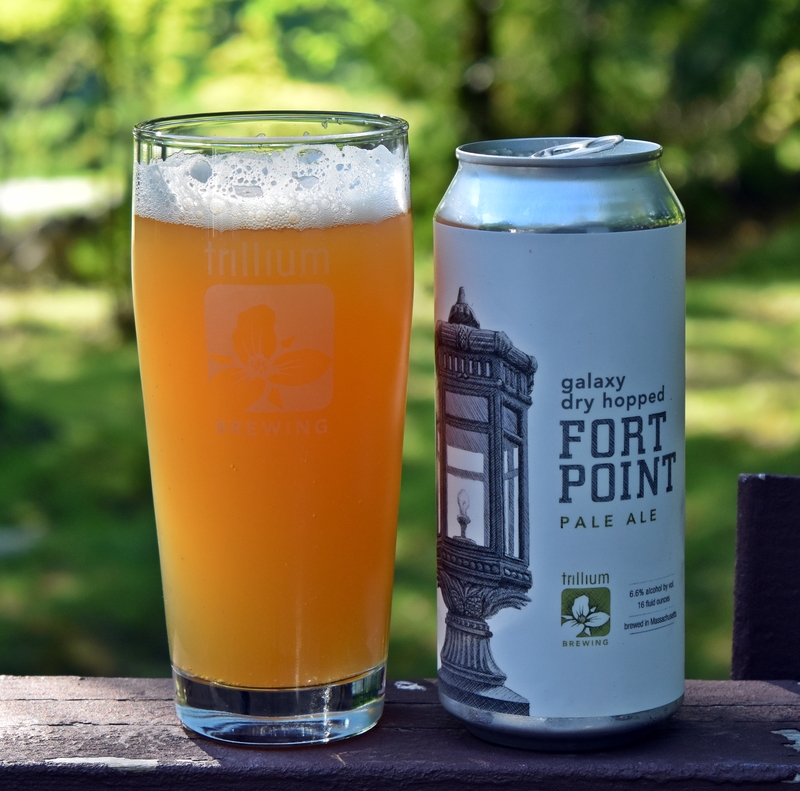 This is the third variety of Fort Point Pale Ale I have reviewed. The original, Mosaic Dry Hopped and now the Galaxy dry hopped version. All have been excellent and received 4.5 star reviews. You just can’t go wrong when you start with such a solid pale ale and amp it up a bit with an extra dry hopping. Appearance is a little less hazy than the original and the Mosaic version but still far from see through. Aroma is loaded with tropical fruits; mango, pineapple, grapefruit and a bit of citrus – really excellent smelling beer. Taste is super juicy fresh hops, not as crazy as the double dry hopped varieties but still a crazy amount of hops especially for what is called a pale ale. Carbonation, mouthfeel are all right where I like them. 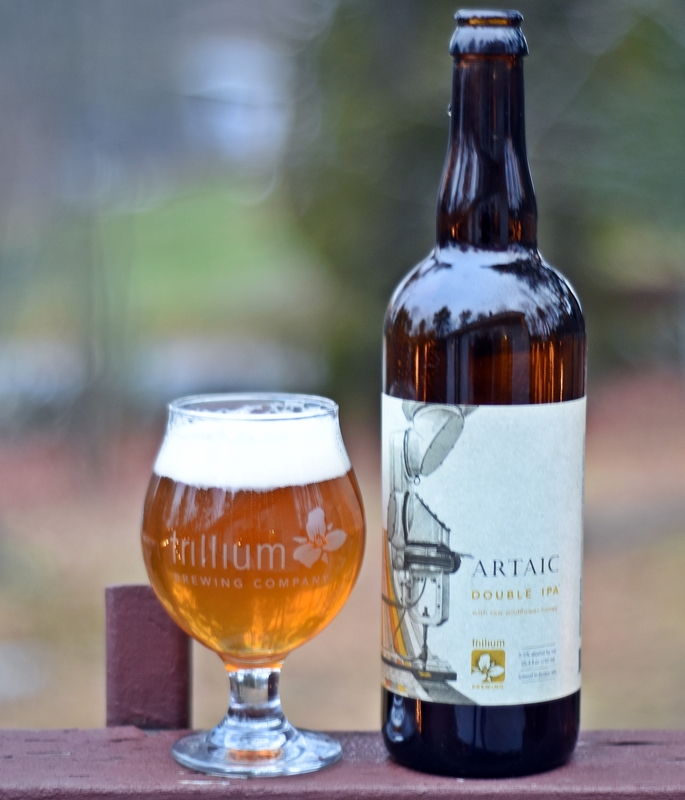 Just another excellent brew from Trillium. 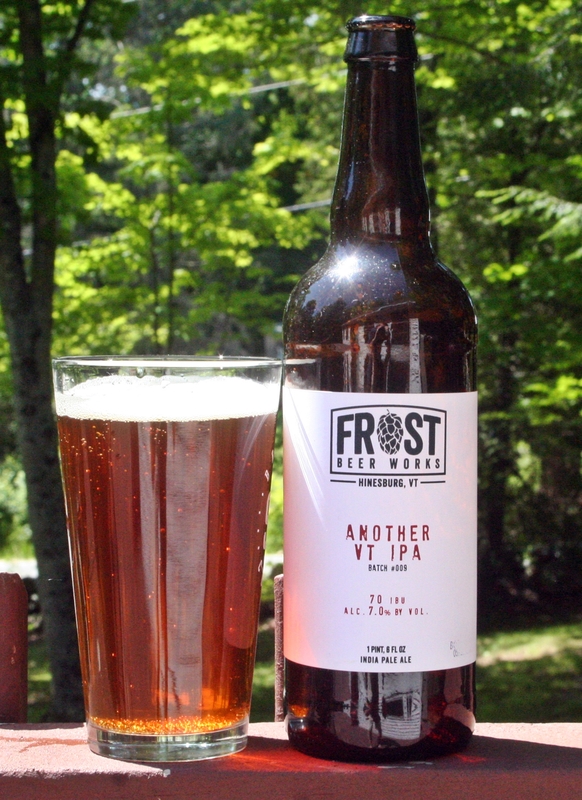 Brewer’s Description: This version of our signature American pale ale is dry hopped with the pungent Galaxy variety. Enticingly hazy and blonde in appearance with frothy carb, the nose erupts with strong citrus, passion fruit, and pineapple aromatics. Upfront and resinous hop-derived flavors of grapefruit pith, peach, and mango are balanced with a subtle, bready malt character and mild, subdued bitterness. I am not a big fan of red ales but after how much I enjoyed Ma from Tree House I decided to open this bottle from Trillium. This beer may be my least favorite beer to date from Trillium but that’s not saying much as they have all been exceptional. Deciduous pours a deep amber with a reasonably thick off white head. Aroma is pine, toffee and pretty sweet. Taste was too sweet for my tastes with some piney hops and a reasonably bitter finish. Overall a well made beer that just didn’t do it for me. If you enjoy red ales than you will likely enjoy this one. 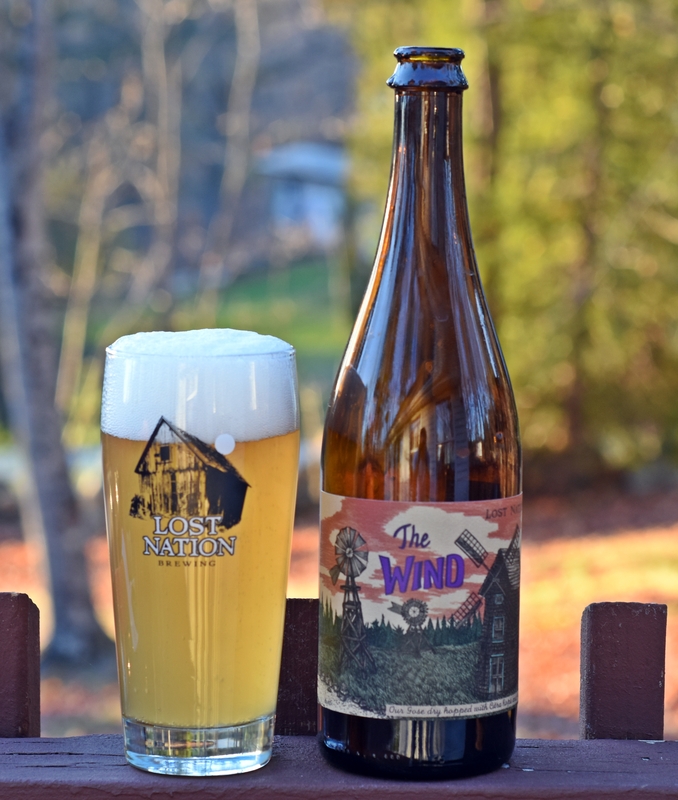 Brewer’s Description: We brew Deciduous to welcome the return of Autumn and celebrate New England’s changing foliage. This imperial red ale is russet-amber and fills the nose with pleasant aromas of fresh baked bread, pine sap, and floral citrus. 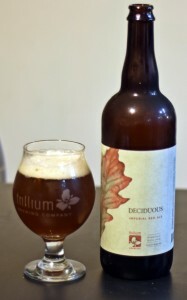 Deciduous embodies the seasonal transition from summer to winter with an earth, lemon and spicy pine aroma balanced on the palate with a hearty malt character and clean, refreshing bitterness. 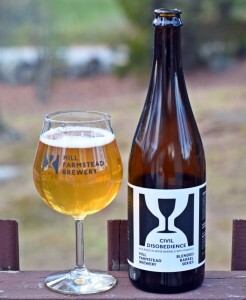 Deciduous is medium in body and dry on the finish. 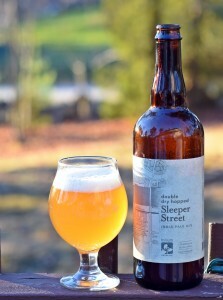 The Belgian IPA or Hoppy Saison is not a style I drink a lot. I like IPAs and drink a lot of them and I like saisons but rarely do the styles mix and create something worthwhile. Hugh Malone from Allagash may be the only memorable beer within the style and this year’s Hugh Malone was even better than the one reviewed above. I got this bottle from a friend and decided to give it a shot. Illumination pours a very bright and clean copper color with a very thick soapy white head. Aroma was an interesting mix of floral hops, saison yeast and a bit funky. 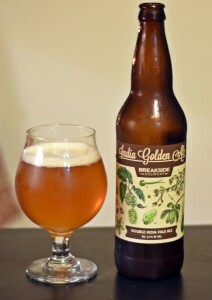 The hops are there in the aroma but they really shine in the flavor with a big blast of citrus and floral hops to start. When I say big I mean big relative to the style, there is enough there to satisfy an IPA drinker but you won’t be overwhelmed by hops. Finish turns more towards that traditional saison with some spice and yeast coming through and a very mild bitterness. Overall a very interesting and complex beer from Enlightenment Ales and one of the best of the style that I have tried. Brewers Description: Illumination is a beer inspired by two of my favorite brewing traditions: the rustic farmhouse ales of Belgium and the generously hopped IPA’s of America’s West Coast. 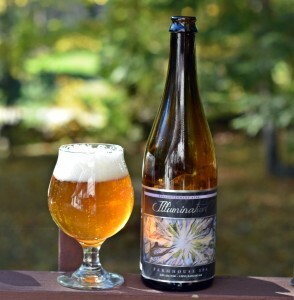 Born from a grist of barley, wheat and rye, and fermented with a blend of infamously expressive farmhouse ale yeasts, Illumination begins its life as a classic Saison, only to be transformed into something unique through robust additions of American dry hops. 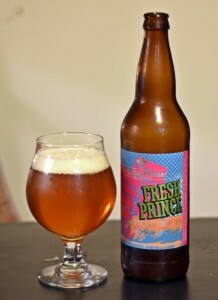 The result is a beer with an intensely tropical aroma, a juicy, citrus flavor, and a dry, crisp bitterness. While this beer may not provide immediate illumination to the mysteries of life, it’s sure to at least brighten the corners.